Bowling Green is turning its goals into reality. As a result, the Falcons are increasing their expectations for themselves and the program. Their next challenge comes this weekend when strive to win the Western Collegiate Hockey Association playoff championship. The Falcons are ranked ninth nationally and 23-10-5 going into Friday’s semifinal against No. 4 Michigan Tech (28-8-2) in the semifinals of the WCHA Final Five at the Xcel Energy Center in St. Paul, Minn. The 20-win season is BG’s first since 1996. The Falcons were 17-8-3 in league play for third place. The Falcons had hoped to win the WCHA regular season championship, but they were 9-7-2 in their final 18 games after an 8-1-1 start. BG is in position to earn an at-large berth to the NCAA playoffs where it last played in 1990. 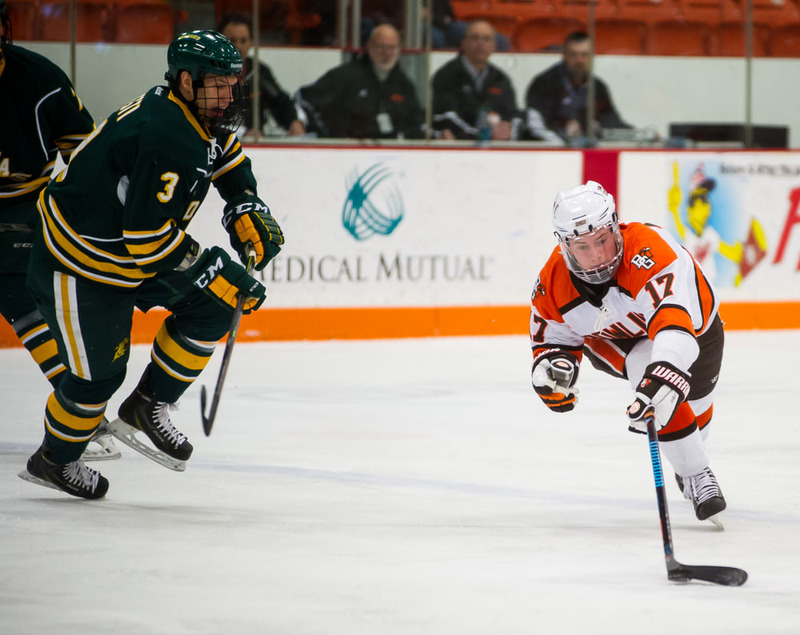 The Falcons also would claim an automatic berth by winning the WCHA playoff championship. The Falcons have won six playoff series in the last five seasons, advancing to their league semifinals three times. BG has hosted a first-round playoff series the last two seasons. “Those expectations and the setting of the bar, those things are real. We expect to be there again,” Bergeron said. FAMILIAR FOE: Friday’s game marks the ninth meeting between the teams, dating back to the start of last season. The Falcons are 4-3-1 in those eight meetings with Tech. “We’re a starting to form a good rivalry, a healthy rivalry,” Tech coach Mel Pearson said. “I like the way they play. They play hard. The teams split two one-goals games Jan. 16-17 after BG swept the Huskies in the WCHA quarterfinals the Ice last season in the Ice Arena. HE’S BACK: Bergeron said BG’s Mitch McLain would play against Tech. The freshman forward didn’t play Saturday against Northern Michigan after being hit hard into the boards during Friday’s game. McLain returned to practice Tuesday, but won’t participate in any contact until the game against Tech. He has nine goals and 10 assists in 37 games, and plays on the special teams. MATURITY: BG defenseman Mark Friedman has played well down the stretch. The freshman has played in every game this season, totaling two goals and 17 assists, and on-ice rating of plus-7. Friedman, a third-round NHL draft pick of the Philadelphia Flyers, also skates on the power-play and penalty-killing units. He was named to the WCHA’s all-freshmen team last week. MR. MARCH: BG junior goalie Tommy Burke has a 4-1 record in five career playoff games, posting a 1.70 goals-against average and a .940 save percentage. This season, Burke has a 2.10 goals-against and a .922 save percentage in 22 games. His record is 14-5-3. He’s improved his goals-against from 2.43 last season which is on pace to set the single-season school record. Burke could break the single-season BG record for the lowest goals-against average. 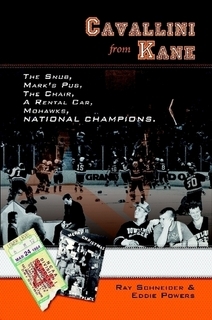 The record of 2.39 was set during the 1978-79 by Wally Charko. Burke’s 2.43 mark currently ranks second. TRAVEL: The Falcons will travel to St. Paul via their sleeper bus. The team will leave BG Wednesday night. The Falcons will practice at the Xcel Energy Center Thursday afternoon and Friday morning.